Step 1: Sprinkle entire surface of steak with 1 teaspoon salt. Let sit at room temperature for at least 30 minutes and up to 1 hour. Step 2: Adjust oven rack to middle position, place 12-inch cast-iron skillet on rack, and heat oven to 500 degrees F. Combine butter, shallot, parsley, chives, garlic, and 1/4 teaspoon pepper in bowl; set aside. Step 3: When oven reaches 500 degrees, pat steaks dry with paper towels and season with pepper. Using potholders, remove skillet from oven and place over medium-high heat; turn off oven. Being careful of hot skillet handle, add oil and heat until just smoking. Cook steaks, without moving them, until lightly browned on first side, about 2 minutes. Flip steaks and cook until lightly browned on second side, about 2 minutes. Step 4: Flip steaks, reduce heat to medium-low, and cook, flipping every 2 minutes, until steaks are well browned and meat registers 120 to 125 degrees F (for medium-rare), 7 to 9 minutes. 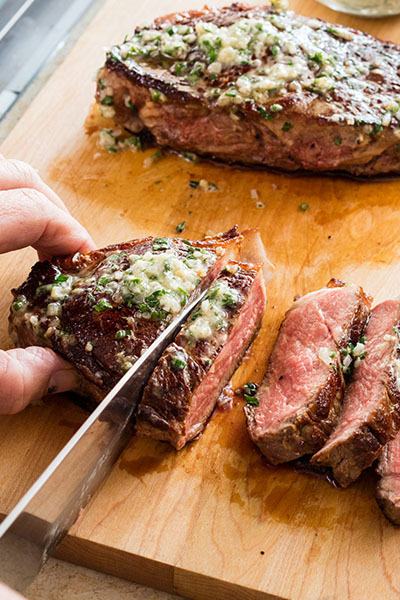 Transfer steaks to carving board, dollop 2 tablespoons herb butter on each steak, tent with aluminum foil, and let rest for 5 to 10 minutes. Slice steaks 1/2 inch thick and serve. Enjoy this great recipe from Cook’s Illustrated!